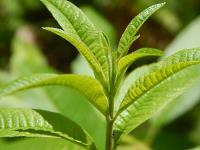 Planning Your First Herbal Tea Garden: Tips to Know Before You Grow! 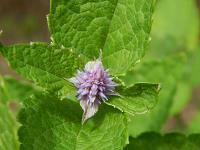 Fear not, DIY herbal tea newbies! Planning an herb garden isn't complicated at all. It's fun, it's easy, and it's a wonderful way to while away a blustery day, waiting for spring to arrive! That's it. That's all. Easy peasy! So grab a piece of paper, a pencil, a tape measure, and let's get to it. Go outside and look around. 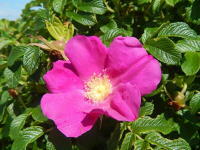 Get to know your outdoor spaces from a plant's point of view. 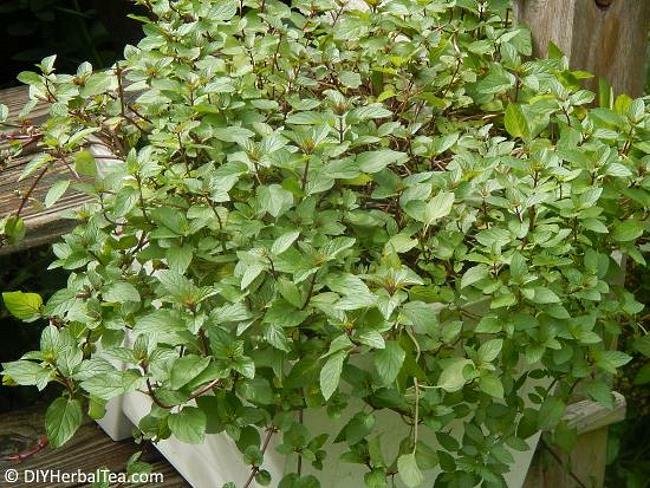 Relatively flat with good drainage - Herbs can handle less-than-perfect soil conditions. What they can't tolerate is standing water around their roots. 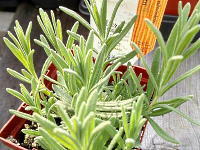 Sunny most of the day - For your herbs to thrive and have good, rich flavor, they'll need at least 6 to 8 hours of direct sunlight per day. A little afternoon shade is good, especially if you live in a tropical climate. Near a fresh water supply - Do you really want to lug heavy buckets of water or a 50' length of hose every time your herbs need a drink? Make watering easy. 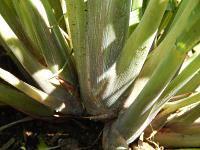 Look for available growing spaces that are near a water spigot. Do you have limited in-ground planting space? Or none at all? Not a problem! 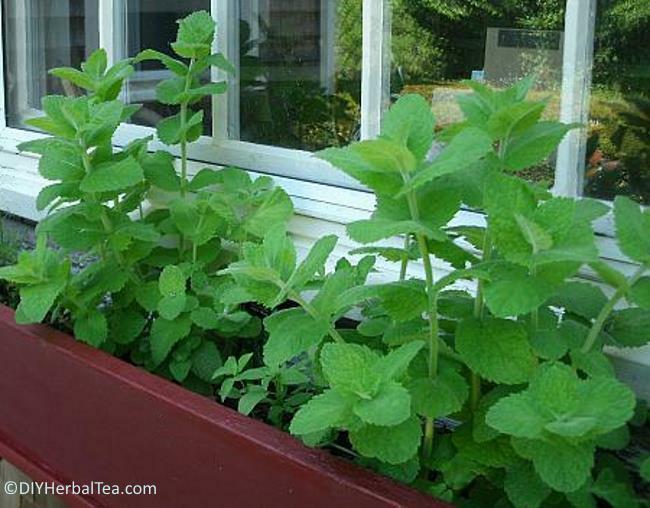 Believe it or not, you can even grow your tea herbs on your driveway, sidewalk, or other "un-plantable" spot. Just grow 'em in a bale of straw. Seriously ... in a straw bale! It works like a charm!! Think creatively if your space is limited. You'll discover plenty of good places to grow your tea herbs, I'm sure! 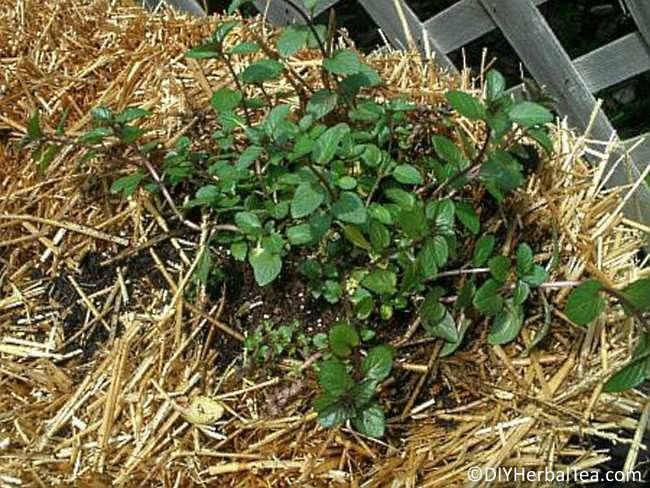 Want to know more about Straw Bale Gardening? Learn from Joel Karsten, the man who invented the process. 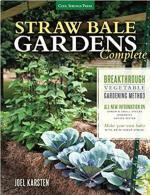 His book, Straw Bale Gardens Complete, is available on Amazon. Have a look at the book. Then give it a try! Now comes the fun part: Thinking about which herbs you'll grow. 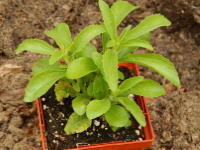 For newbie herbal tea gardeners, I always advise to start small. Choose a couple "basic" tea flavors like mint and chamomile. Then pick a few more to experiment with new flavors and custom blends. Want to add a splash of color to your yard, patio or balcony - and unique flavors to your cup? 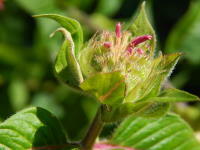 Grow at least one flowering herb. How much gardening time do you have? Herbal tea gardening is a fun adventure! 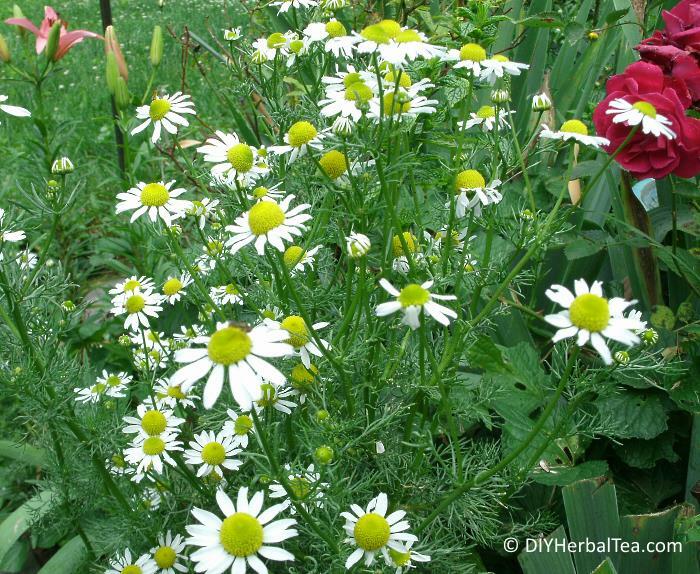 Don't plant so many herbs that tending your garden becomes a chore. How much tea do you need? 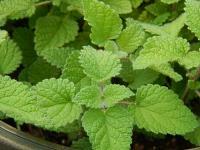 Why grow bushels of herbs that'll ultimately go to waste? Plan to grow only as much as you'll realistically be able to use - and give as gifts - in a year. The chart below will help you choose the best location for each herb. 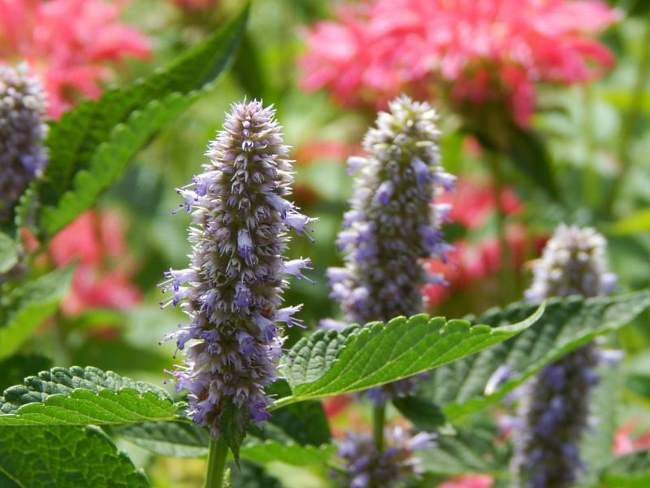 Mints X X X X 12"
Chamomile X X X X 12"
Lemon Balm X X X 12"
Lavender X X X 18"
No matter how large or how small your garden will be, it's a good idea to have a general game plan before you start planting. Yes, I said "draw". But please, don't let any lack of artistic talent hold you back. You're not re-creating the Mona Lisa here. 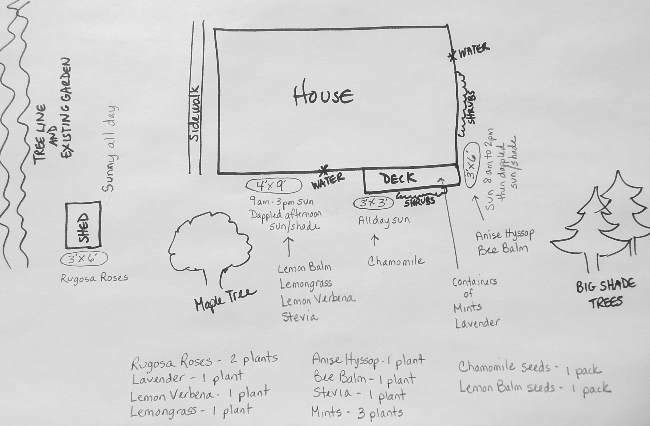 You're simply making a rough sketch to refer to when it's time to order your herb plants and seeds. Helpful Hint: If you don't have a tape measure handy, you can "walk off" your measurements. The average length of a woman's natural stride is about 2.2 feet; for men it's about 2.5 feet. Note: This is my current garden layout. 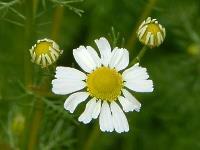 It's evolved over time from just a single patch of chamomile to ... well, let's just say - I'm addicted to tea gardening!! Helpful Hint - When you're designing your herb garden layout, do your best to keep "like with like". 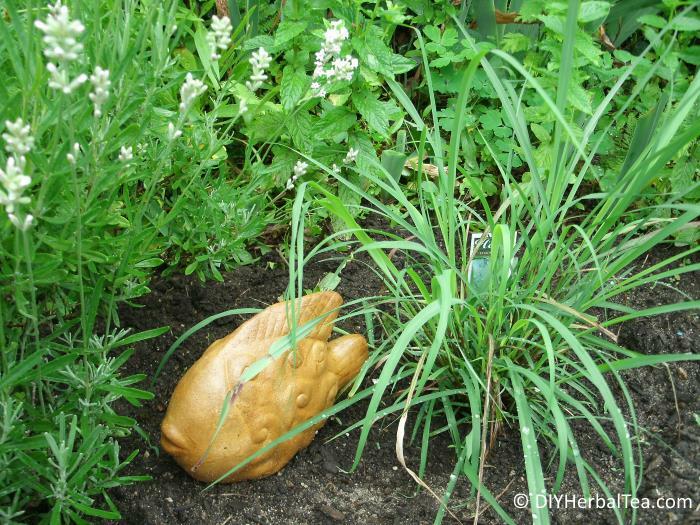 For example: Plan to grow water-loving herbs in one area, drought-tolerant herbs in another. That way, when you water the moisture lovers, you won't risk drowning the others. Are you late to the DIY herbal tea party? 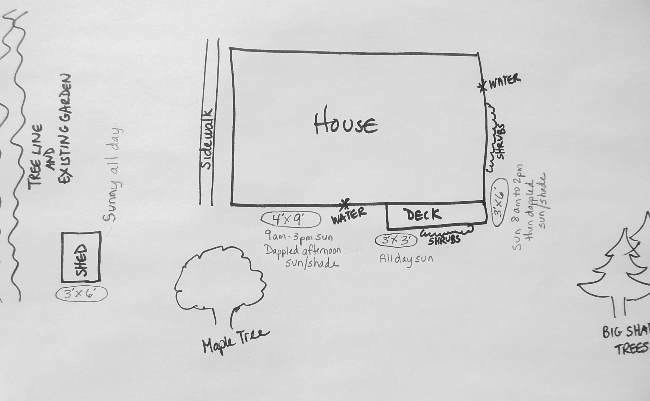 If growing season is already here and you haven't created a detailed garden plan ... that's okay. Many of us (yours truly, included!) started tea gardening by what I fondly call the "wing it" method. And you know what? It worked out just fine. So go ahead. Buy a few starter plants, and go for it! With a bit of loving care, your herbs will reward you with yummy, homegrown herbal tea ... despite your lack of planning!